Discover and learn more about tea and its culture. 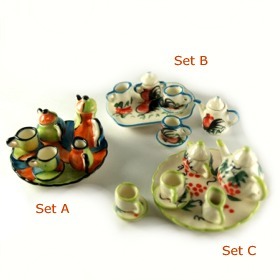 Miniature Teapot Set contains one small teapot, sugar bowl, creamer jug, two cups with saucers. This Miniature Teapot Set also comes with a tea tray with 6 cm diameter. Teapot, bowl, jug and all the teacups can be placed on this small tea tray. Elegant Miniature Teapot Set we have seen so far. This teapot set is made by highly skilled artisan and requires great workmanship’s effort and time. Great as a collection. Comes in a gift box.